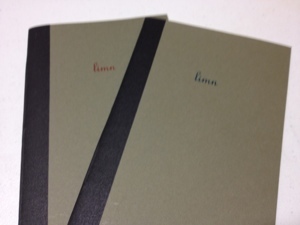 Limn Books come from Austin Texas. At the moment they come in two flavors of 5.5x 8.5. The flavors really only mean that one has red lettering and the other has blue. The only lettering is Limn on the cover and a contact email on the back. They contain 20 sheets of plain paper (no lines) covered by green cover stock. 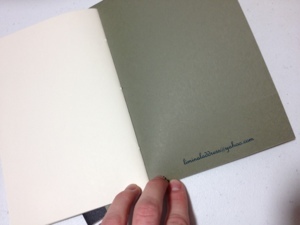 They are hand-sewn, single signature bound then covered with a binding strip. The covers are quite nice at protecting the books and looking nice, but they are not stiff enough to write on, so writing will require a table. The paper is almost butter, smooth but with enough grit to hold ink on the page well. Ink bleed is not much of a problem, especially if one is just writing and not drawing. 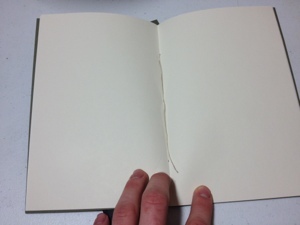 They are comparable to Moleskine books in both paper and cover quality, but lack the elastic and are quite bit cheaper. They are nice, inexpensive little books. They write well, are extremely portable, and are generally handy. They are good books for keeping notes, lists, and ideas. They have no real specific purpose in my mind, and are good at anything one wants to do in them, but are not necessarily the best at anything.